Ryan, controlling the action and calling the play-by-play. He has his roster sheets, goal light and spotlight at the ready. Ryan was targeting July 4 for weeks — dating back to when I was on the road for the Stanley Cup Final. My pay-off for losing our epic street-hockey series was to serve as the color analyst (to Ryan’s play-by-play) for a Hockey Guys game. But not just any Hockey Guys game. A playoff game between the Ducks and Sharks, to be played out in real-time: 20-minute periods, full intermissions, television timeouts. Ryan told me to expect the game to last at least three hours, maybe longer if it went into overtime. Oh boy. Three hours? Sitting on the floor in Ryan’s room, shades drawn, door shut? This was going to be a long one. Veronica reminded me that I lost a bet to my son, and all he wanted was to spend time with me. I couldn’t really complain. I could, however, have used more sleep. Ryan came into our room at about 6:15 a.m. to wake me up and remind me it was bet day. Somehow, I talked my way into a couple of hours of extra sleep, but the game was to begin by 9 a.m. I settled in. Ryan allowed me to lie on his bed, while he controlled the Hockey Guys and called the action from his floor. 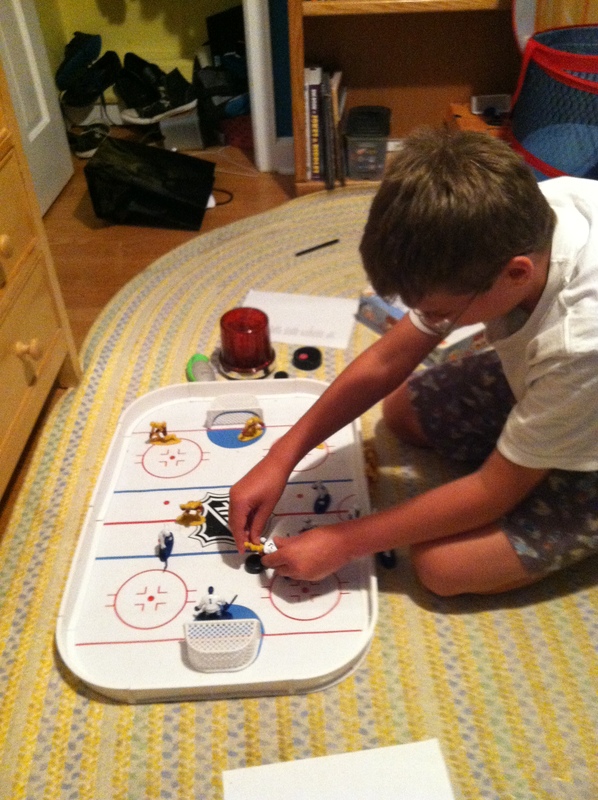 The Hockey Guys are one of the best purchases we have ever made for either of our kids. They have provided Ryan with hundreds of hours of — yes — imaginative play. We almost never leave for an overnight trip without them. It’s true that the constant play-by-play emanating from his room at top volume drives us bonkers at times, but when I am able to see him up close, I love the level of detail Ryan puts into how he plays with them. He has his official goal light, to turn on any time a team scores. He keeps a flashlight handy to shine on the player who scored, just as they do with a spotlight at real NHL arenas. For this game, he even prepared roster sheets so he could call the names of all the players on both teams — just like real announcers do. 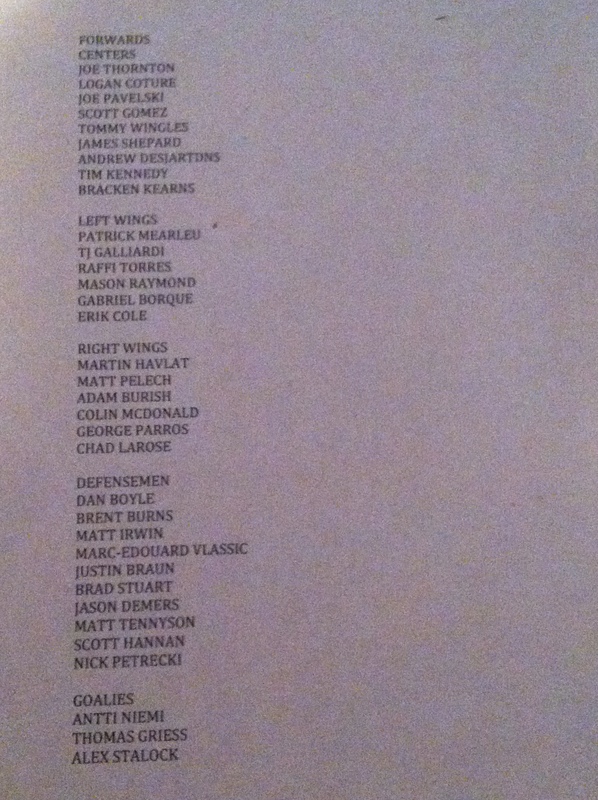 The Sharks roster sheet, as prepared by Ryan for the big game. On the “ice” his Hockey Guys are also incredibly realistic. They line up for faceoffs. They go to the penalty box. They come to the bench for line changes. And after the game, the winning team celebrates with its goalie, just like the real teams do on TV. I love the amount of detail Ryan puts into his Hockey Guys games. Here the “Ducks” (in white) have dumped the puck into the “Sharks’ ” (in yellow) end, and both teams head to the bench for a line change. I wanted to help him out with the realism, so I fetched my iPad and fired up the Giant Scoreboard app to keep time. (And, if I’m being honest, I had a feeling keeping time on an official clock would help keep us under the three-hour window). The game started. I handled the clock and threw in some occasional color commentary. 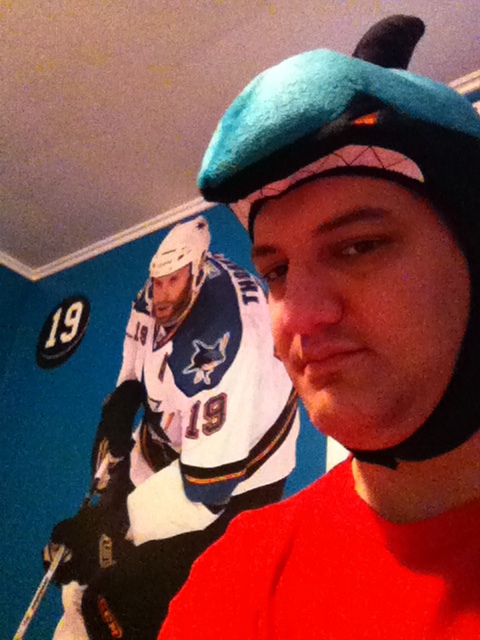 I put on Ryan’s crazy Sharks-head hat, but he got mad at me because the announcers should be neutral. Hello, I’ll be your color analyst this evening. Ryan got mad at me for wearing the crazy Sharks hat because TV announcers are not supposed to be “for” one of the teams. What can I say? I was intimated by the Joe Thornton Fathead. I successfully talked him out of taking full TV timeouts and 18-minute intermissions. 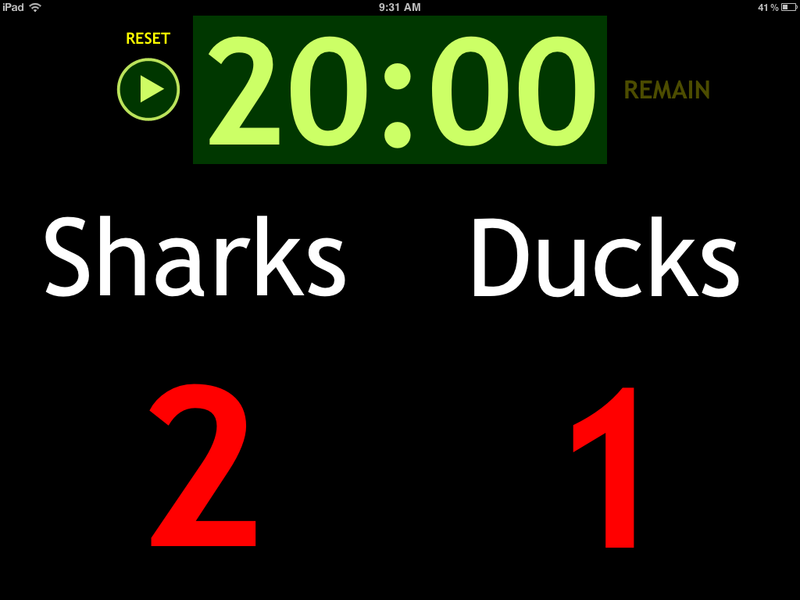 At the end of the first period, the Sharks led 2-1, but my Giant Scoreboard app just wasn’t cutting it. I was caught up in Ryan’s quest for realism. During the (brief) intermission I went app surfing for something better. 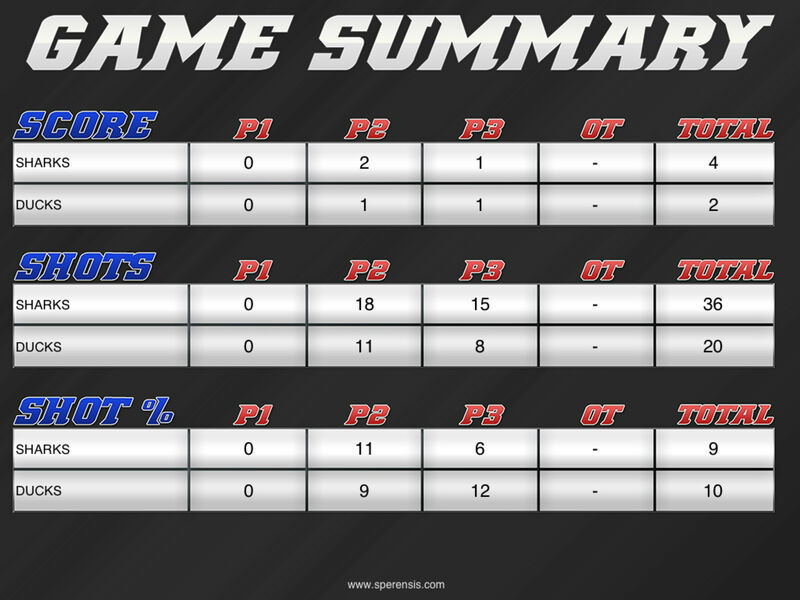 I found the Hockey Scoreboard app, which included penalty time and shots on goal. Plus, it paired with my existing Goal Horns app to play the proper goal horn and celebration song (but only for the home team, the Ducks, because don’t you know in real life they don’t play the horn or song when the visiting team scores). Ryan was a bit unhappy with the change in routine, but as soon as he saw the shots-on-goal clock and heard the horn, he nodded his approval. 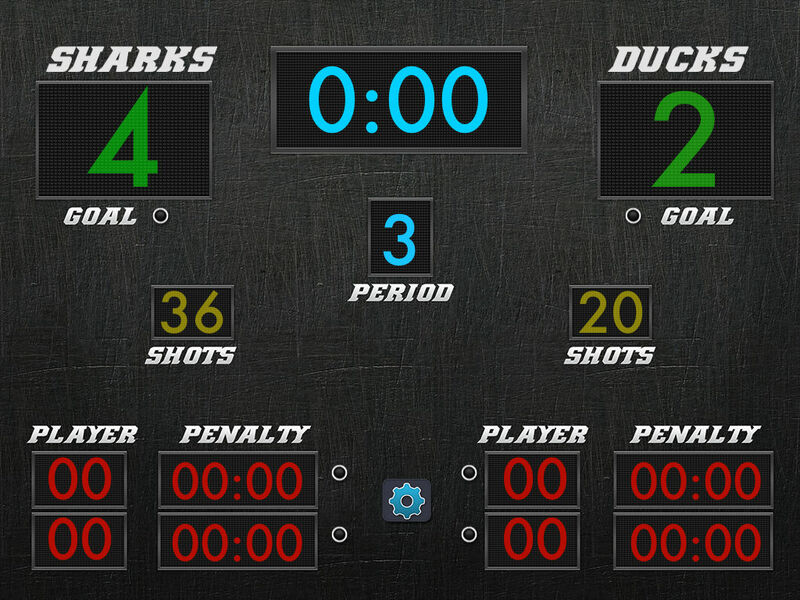 In the end, the Sharks gutted out a 4-2 win (with an empty-netter at the end), mercifully avoiding overtime. It took a little over two hours, but seemed like less. Ryan declared the bet satisfied — even though he was mad I didn’t film the whole thing. The final score, courtesy of the Hockey Scoreboard app. The game summary, courtesy of the Hockey Scoreboard app (I downloaded it after the first period, which is why there are no stats for the first. Ryan was not pleased with this inaccuracy). 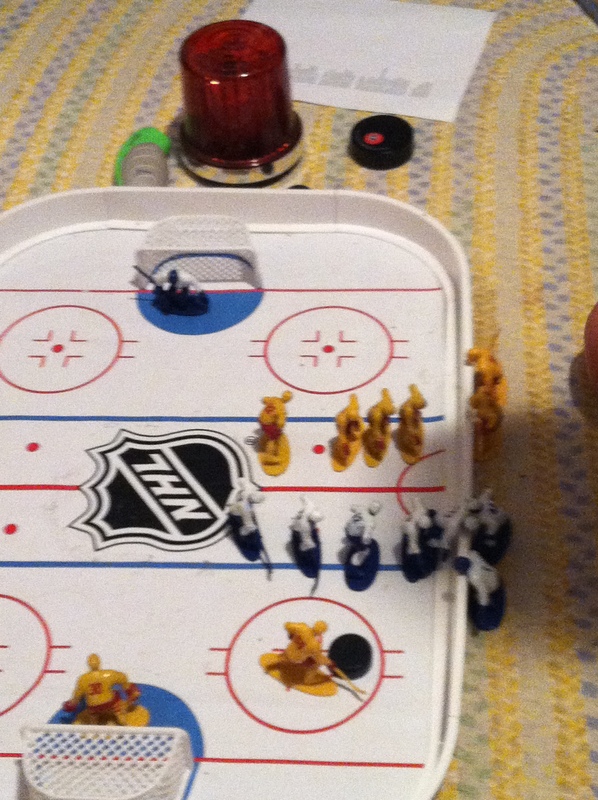 I continue to marvel at Ryan’s powers of observation and his ability to recreate the minutia of a hockey game using plastic figurines, a few household items, and his imagination. Kids on the autism spectrum have no imaginative play, right? Wrong. The Hockey Guys’ postgame celebration says otherwise. 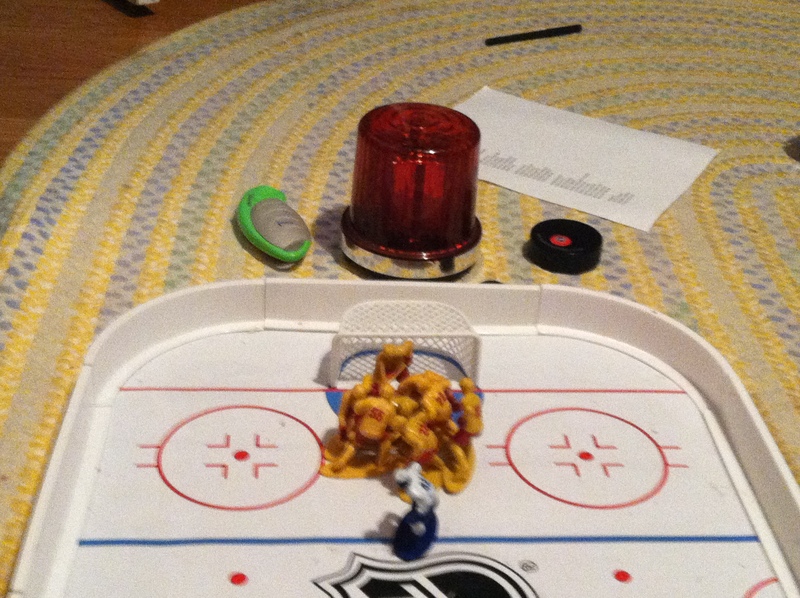 After the game ends, the Hockey Guys “Sharks” gather around their goalie to celebrate, just like real hockey guys do. Behind, Ryan’s flashlight — used to put a “spotlight” on the goal-scorer, the goal light, and the Sharks roster sheet. Who said kids on the spectrum don’t have imaginative play? You don’t look real happy with the Shark Hat. Really glad that you could keep the time under 3 hours. But it was a very special time that you will look back on and smile years from now. I think I look quite compelling in that hat. It hides my second chin. There is a lot of wonderful in this post–and it sounds like you have another terrific hockey-related memory in the books. I loved how Ryan had the guys celebrating at the end. He did not leave any detail out! The details are my favorite part. There are dozens more little things he does. I notice something new every time I watch him play.